Which Athlete Did Freddie "FredEx" Mitchell Ensnare In His Low-Rent Tax Evasion Scheme? Former Eagles wide receiver Freddie Mitchell, who is mostly known for catching one long pass and giving himself a catchy nickname, has been facing tax evasion and fraud charges since March of last year, and pled guilty to filing a false tax claim yesterday. That crime carries a maximum penalty of ten years in jail and a $250,000 fine, both rough prospects for Mitchell. Still, what's really curious is the case's unnamed party: the fellow athlete that Mitchell somehow ensnared in all of this. The U.S. Attorney's office referred to him or her only as "A.G.," and whoever it is, Freddie Mitchell conned that person into participating in a scheme that involved Freddie Mitchell preparing his or her taxes. For public safety' sake, he or she should probably be locked up too. Mitchell, 34, of Lakeland, admitted to working with former Internal Revenue Service employee Jamie Russ-Walls and her husband Richard Walls to file false tax claims on behalf of another professional athlete. Mitchell told the other athlete - referred to by the U.S. Attorney's Office as "A.G." - Russ-Walls could get A.G. extra money back from the IRS. A.G. paid Mitchell $100,000 as a down payment for a tax preparation fee, which Mitchell, Russ-Walls and Walls split, according to a plea agreement. The three then filed a false 2008 tax return for A.G., claiming $5.4 million in false business losses resulting in a refund of nearly $2 million. A.G. was unaware of the crimes, the agreement said. An athlete whose initials could be A.G.—though they might not be, because that would be too obvious—who has associated with Freddie Mitchell, thought having him and his cohorts prepare a fraudulent tax return would be a good idea, and is currently cooperating with the IRS. Your guess is as good as ours. Mitchell's co-conspirators, who confessed before he did, have already been sentenced to 37 months in prison and five years probation, respectively. 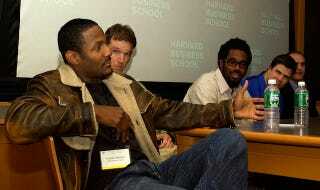 Above: Mitchell speaking at Harvard Business School in 2005, during a workshop for NFL players interested in owning or operating their own businesses.